The people of Myanmar have full confidence in their de-facto leader Aung San Suu Kyi to resolve the issue of violent clashes between the security forces and the Muslim minority in the country's northern Rakhine State, student at the Myanmarese diplomatic academy Nay Myo Zin told Radio Sputnik. The recent escalation of conflict between the Buddhist majority and the Muslim Rohingya minority in Myanmar's northern Rakhine State has been condemned by the international community. The long-running conflict flared up again last month, after Muslim insurgents attacked security posts in Rakhine State on August 25. The attacks prompted a response from Myanmar's authorities, resulting in clashes and the death of hundreds of Rohingya. According to the UN, nearly 125,000 Muslims have been forced to flee Rakhine State since the violence broke out, many of whom have fled to neighboring Bangladesh. Nay Myo Zin, a student at Myanmarese diplomatic academy, gave Radio Sputnik his take on the outbreak of violence in Rakhine State. "They announce themselves as the 'Arakan Rohingya Salvation Army,' and carry out extremist terrorist acts. The government and the people of Myanmar don't accept the naming of the Rohingya and therefore the 'Rohingya crisis' in Myanmar can't be happening. [This is] only a problem of illegal immigrant Bengali and the local administrative government," Nay Myo Zin declared. The Arakan Rohingya Salvation Army (ARSA), formerly known as the al-Yaqeen Faith Movement, has taken responsibility for last month's attack on 30 police posts and an army base, in which militants attacked security forces with sticks, knives and crudely made explosives. The Myanmar government calls the ARSA "extremist Bengali terrorists" whose leaders have been trained abroad. 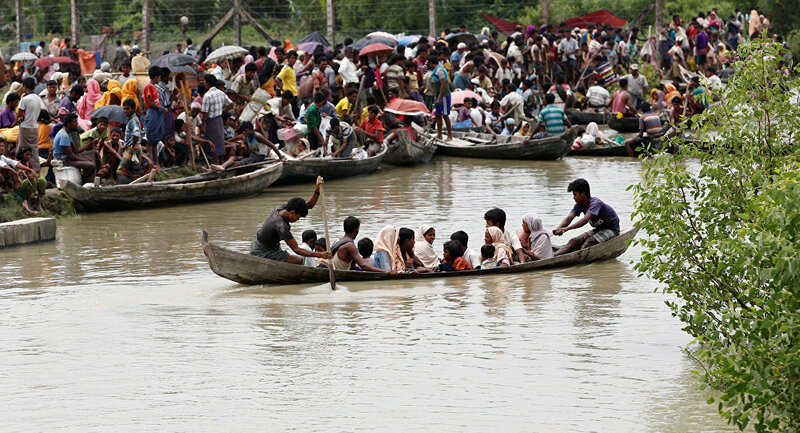 According to a report from the International Crisis Group (ICG), the group seems to receive support from the Rohingya diaspora and major private donors in Saudi Arabia and the Middle East. Nay Myo Zin said the violence has been caused by "illegal immigrants to Myanmar from Bangladesh," who are attacking local people in Rakhine state. "Their fate depends on their behavior. If they carry out terrorism, they will get attacked by local regional defense forces." "Most of our people appreciate the Muslim minority, we love and accept them. I have a lot of Muslim friends and I love them. It's just that now these extremist Bengali terrorist groups have started these hostilities toward the Rakhine people and they broke our laws." "Our Burmese don't want any brutality or any terrorists. We want to live in peace, fully." Myanmar's de facto leader Aung San Suu Kyi, who was awarded a Nobel Peace Prize in 1991 in recognition of her campaign for democracy, has faced criticism for her handling of the crisis. On Wednesday, she stated that there has been "a huge iceberg of misinformation" about the violence. Russia opposes the violence and has called on the authorities of Myanmar to get the situation under control. Nay Myo Zin expressed confidence in the security services and Myanmar's leader Aung San Suu Kyi to adequately deal with the issue. "Mostly, we love and 100% trust our State Counsellor Aung San Suu Kyi, she always leads with her heart. We love her and trust her. So, our government has to solve this very difficult problem, of Bengali terrorists calling themselves 'Rohingya.'" He alleged that some members of the Muslim minority in the Rakhine State are engaging in illegal activities and spending the profits on militancy. "For example, in this Rakhine there are two kinds of Bengali people. One kind is working in drug trafficking and human trafficking, they make a lot of money and they spend it on guns and explosives. They want to separate their land as their own, as an Islamic state." "Another type of Bengali group want to live peacefully as Burmese citizens, together with the Rohingya and other Burmese people. If Muslim people want to live peacefully, it's no problem to live in our country." Most Rohingya have never been granted citizenship of Myanmar because the government considers that their migration to the country, most of which took place during British colonial rule, was illegal. Despite that, Nay Myo Zin asserted that many have been able to obtain citizenship under the 1982 Burma Citizenship Law, which allows a person to receive citizenship if they can prove their ancestors settled in the country before the beginning of British occupation in 1823. "Our government allowed a lot of people to get citizenship. In accordance with the 1982 Immigration Act, they have the chance to get citizenship. If they don't have a chance by law, they can't get citizenship," he said.